Taking the family on vacation when you have small children presents the challenge of finding a spot with amenities to cater to the little ones and the parents looking to simply unwind for a week. In New Mexico, you’ll find a wealth of hotels and resorts looking to keep your children entertained and keep you stress-free! Here are the 10 best in the state. Grab your cowboy hat and pack your spurs and get ready for a family horseback ride adventure at this ranch in the 3.3 million-acre Gila National Forest. An all in-clusive stay here includes lodging in a comfortable rustic cabin, three hearty meals a day, and all the horseback riding you can handle for the duration of your stay. At the end of the day, you can sit around the campfire, watch a western movie, play some games or line dance ’til the wee hours of the morning. Open March through November. The fish are biting at this beautiful 38-acre family vacation spot on the shore of Tall Pine Lake. The lake, stocked weekly, has some of the best trout fishing in the state. This resort has been a destination for families since the 1920s. Some come back to the same cabin year-in-and-year-out, staking out a base camp along the nearby Red River. When you get tired of fishing, take a hike right where you are in the Carson National Forest. Open mid-May through the end of September. Remember to bring your waders. Staying at this resort makes for a great home base for all of the fun and interesting things to do in and around Santa Fe. The suites are like small apartments complete with a modest kitchen with refrigerator, stove, microwave, all of the paraphernalia needed to cook, and even a dishwasher. Spend time together at the heated pool, game room or fitness center, or head out for hiking in the Sangre de Cristo Mountains, a hot air balloon ride, river rafting, a bike ride around town or some quiet time at a museum. Finish the day with a barbecue of your own making at the outdoor barbecue area. Kids will not be bored here. They’ll stay busy. There are three heated pools, tennis courts, a championship golf course, as well as seasonal access to volleyball, horseshoes, basketball, croquet, bocce ball, and tether ball. The resort rescues horses for trail riding and lead-arounds. Then there are the Srai Wi activities, cul-tural learning experiences just for young guests, that teach them about and how to make local Native American arts and crafts. Finally, there’s Camp Hyatt for children ages three to 12, a fun place for kids to spend a day, independent of parents. This lovely heritage hotel is a just the right place to begin an adventure. Gener-ously sized suites provide plenty of room for families to unpack and stretch out. The hotel has put together a family package for a visit to White Sands National Monument complete with sand sleds and an adventure pack for a day on the gypsum dunes. Back at the hotel, jump in the pool or enjoy a soak in the hot tub for a relaxing end to the day’s activities. As the preferred resort for Spaceport America, this hotel is also the launch pad for visits to this out-of-this-world tourist experience. This delightful lodge can accommodate families of all sizes in a variety of multi-room and multi-bath condominiums. In winter, family activities are all about how to have fun in the snow. Summertime brings with it white water rafting adventures, horseback riding, fishing, rock climbing, hiking, mountain biking and, for the really intrepid, rock climbing. Condos have fully-equipped kitchens for meal-making, or eat out at one of the lodge dining spots. Every room in this upscale relaxed resort environment is a two-room suite that provides all the comforts of a home-away-from-home. Everyone can carve out a spot in these spacious rooms. The free cooked-to-order breakfast each morning is a culinary highlight with everything from omelets to oatmeal to fresh pastries. The indoor heated pool is a relaxing hangout after a busy day at any number of activities in town or exploring the nearby Sandia Mountains. The kids will love movies in the atrium. This family resort is a working ranch where guests are the ranch hands … by choice. Ever wondered what it was like in the Old West? Well, a stay here will open your eyes to life in the late 1800s with an emphasis on the fun part. The setting is right smack-dab in the middle of 8,200 acres of unspoiled breathtaking scenery. Get on an Appaloosa or Quarter Horse or ol’ Paint and ride the range for a minimum of three days or longer. Training in roping and shooting, helping with branding and cattle drives, fishing in the nearby Pecos River and sittin’ ‘round the campfire keeps everyone busy from sunup to sundown. A stay at any one of the vacation cabins, private homes or townhouses in-and-around Ruidoso overseen by this local management company provides an op-portunity to create your own style of family vacation. There are a wide-range of choices that can accommodate families from two to 18 people; larger groups can stay in homes in close proximity to each other. Places like Eagles Perch, Whirla-way Cottage, Almost Heaven, Lazy River Hideaway and even The Tree House, perched on top of a private hill are just a few of the possibilities. 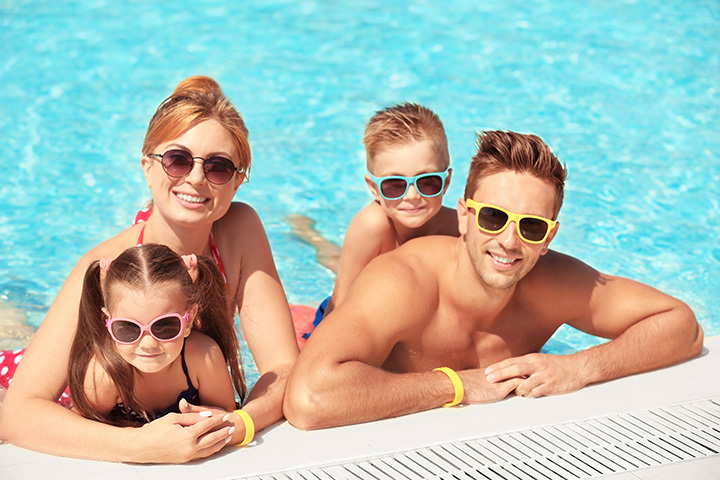 Check for special offers that extend your stay for a great family escape. This lodge is the hub for unbelievable outdoor experiences that involve horses, chuckwagons, gold panning, rustic cabins, tent camping, wagon tours and carriage rides. There is literally something to do for every family member, of all ages and skill levels. Group rides and overnights are an amazing family bonding experience. After a day or two of participating in any of these adventures, return to the comfort of this comfortable and cozy lodge with rooms that have all of the comforts you won’t find on the trail. This family-owned and operated lodge has been a landmark in town for more than 20 years.